So I was able to finish one of the wallpapers I had in-process to the end of this year & here is it. 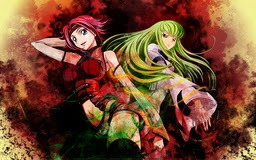 A wallpaper to the series Code Geass, with Kallen Stadtfeld and C.C. It is little different then usual, it is more "abstract". Hope you will like it.